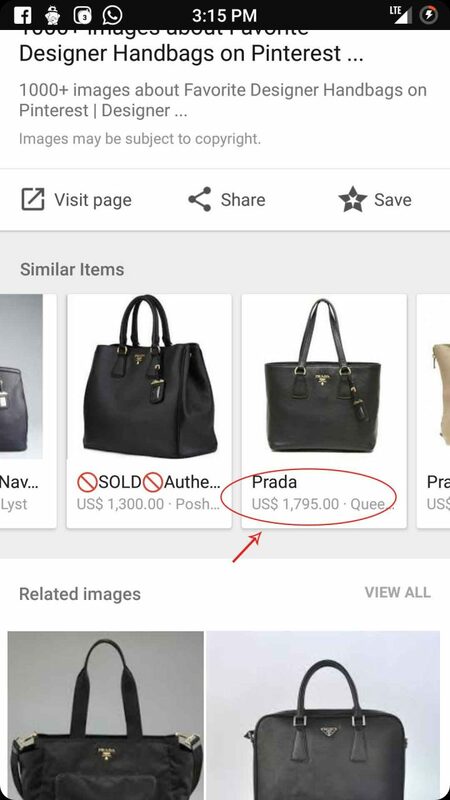 Google Image Search launched Similar Items feature for Mobile web and Android Search app. Images are a great way to look up a product. And what better place than Google Images to search for anything under the Sun. And with Similar Items, user will not only see the images but also similar items. The cherry on top is that not only the similar items but their price and availability will also be displayed under the image. Currently, this feature covers handbags, sunglasses and shoes and will cover other apparels soon. This feature is launched for mobile web and Android’s search app only. It will be launched for other platforms too. There’s nothing new that you’ll have to do to use the Similar Items feature. You just have to search what you are looking for as always. Now, when you click on a particular image, the items similar to the one that you clicked will be displayed. And under the image, you can also view its price and availability. As simple as that. This is definitely going to make search easier and interesting. To make the products from your website to be eligible for Similar Items, add and maintain product metadata. Name, image, price and currency and availability should be maintained on the metadata page. Also see Google guidelines for product metadata. To see your images, go to Google Images and type “site:yourdomain.com”. This query will list images from your website. This way you can check if the images appear in the search as you expect them or not. This is what we found on typing our website’s name. So, people get going and explore with Similar Items for a better experience.